(Nanowerk News) Serendipity has as much a place in science as in love. That’s what Northeastern physicists Swastik Kar and Srinivas Sridhar found during their four-year project to modify graphene, a stronger-than-steel infinitesimally thin lattice of tightly packed carbon atoms. Primarily funded by the Army Research Laboratory and Defense Advanced Research Projects Agency, or DARPA, the researchers were charged with imbuing the decade-old material with thermal sensitivity for use in infrared imaging devices such as night-vision goggles for the military. 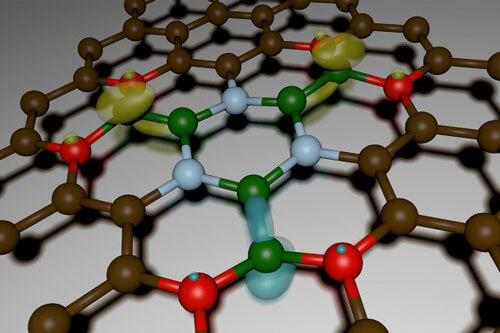 What they unearthed, published Friday in the journal Science Advances ("Atomically thin layers of B–N–C–O with tunable composition"), was so much more: an entirely new material spun out of boron, nitrogen, carbon, and oxygen that shows evidence of magnetic, optical, and electrical properties as well as DARPA’s sought-after thermal ones. Its potential applications run the gamut: from 20-megapixel arrays for cellphone cameras to photo detectors to atomically thin transistors that when multiplied by the billions could fuel computers.